On the west side of cap frehel by the side of the D34 midway between Sables d’Or and Cap Frehel. An aire and carpark, spread over several bays. Look for the large raised parking area, vans parked overnight here. Very quiet in winter and can seem isolated. 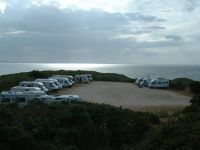 Cost per 24hrs: Overlooking one of the best surfing beaches in Brittany Great for dog walking and walking along the cliff tops. Lighthouse can be seen at night.